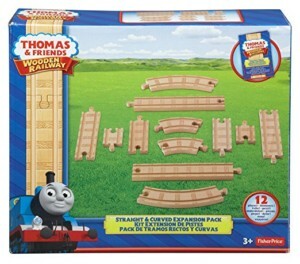 The TrackMaster Treasure Chase Set from Fisher-Price is inspired by the Thomas & Friends DVD adventure, Sodor’s Legend of the Lost Treasure. 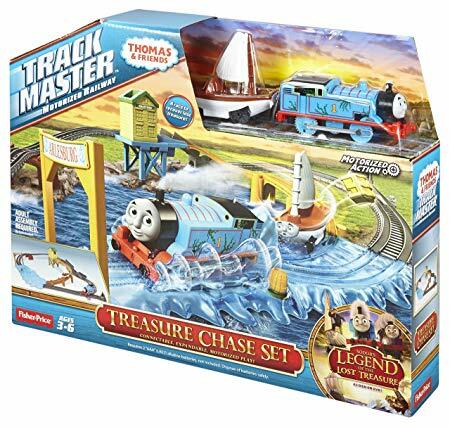 Skiff the rail-boat is trying to escape with the treasure, but Thomas won’t let him get away without a chase! 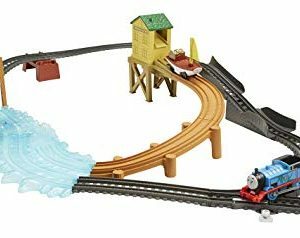 As Thomas speeds past the shed, Skiff is released down a separate track, and when Skiff hits the water, he loses the treasure on impact! 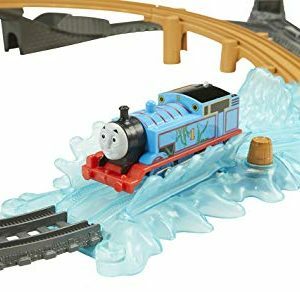 Thomas is in close pursuit, but he gets stuck in the splashing waves when he reaches the harbor! 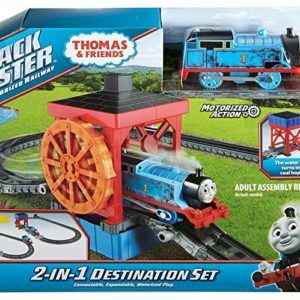 Press the button to release Thomas, so he can continue on this exciting journey. 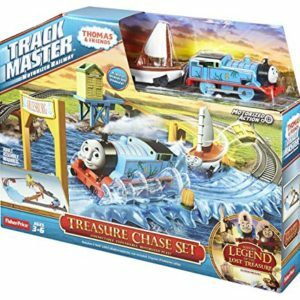 Inspired by the Thomas & Friends™ DVD, Sodor’s Legend of the Lost Treasure, the TrackMaster™ Treasure Chase Set from Fisher-Price captures all the fun-filled action and adventure of the movie! 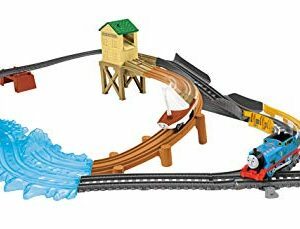 Start by loading the treasure cargo piece into the shed at Brendam Docks so it slides down into Skiff’s hull, then send Thomas racing past the shed. As the No. 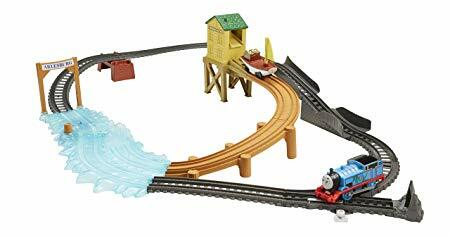 1 blue engine passes, he automatically releases Skiff the rail-boat, who is trying to escape with the treasure. When Skiff reaches the end of his track and crashes into the water, the treasure chest is launched from his hull. 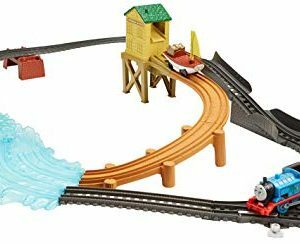 Thomas is in close pursuit, but – oh no! 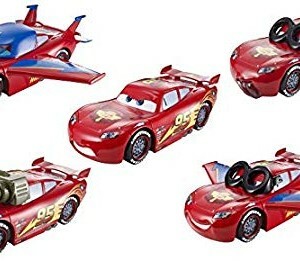 – he gets stuck in the splashing waves when he races into the harbor! 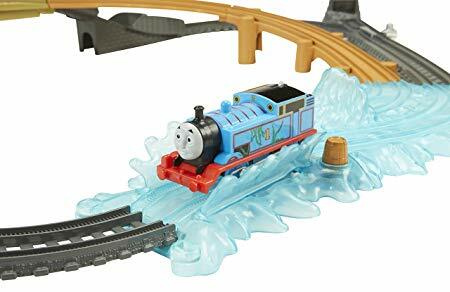 Press the button to release the stop-track and free Thomas from this watery obstacle so he can continue on his way. 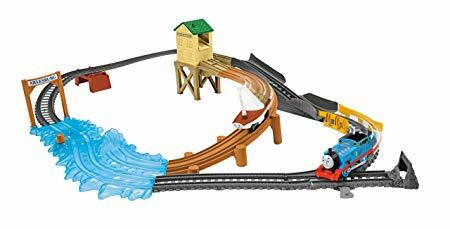 Welcome to the connectable, expandable, motorized world of TrackMaster from Fisher-Price. 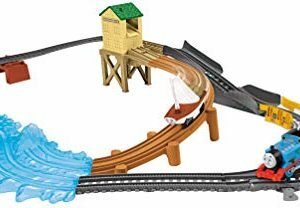 TrackMaster lets you build your own custom-made motorized railway with thrilling train sets, connectable expansion packs, and your favorite Thomas & Friends characters. 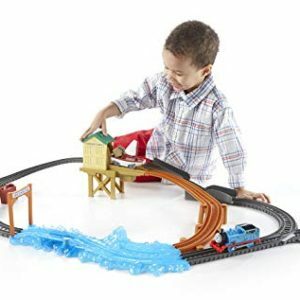 The Thomas & Friends TrackMaster Treasure Chase Set offers exciting, fun-filled play that may help your child develop physically and cognitively. 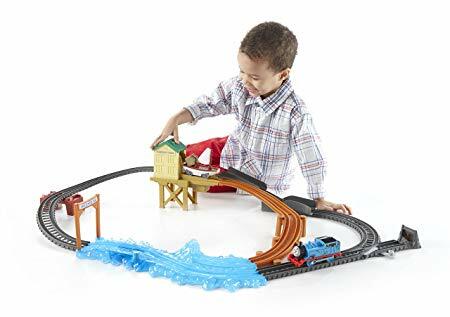 The sights, colors, and textures provide an array of visual and tactile stimulation, while grasping the train, turning it on, and rolling Skiff along helps introduce eye-hand coordination and finger dexterity. 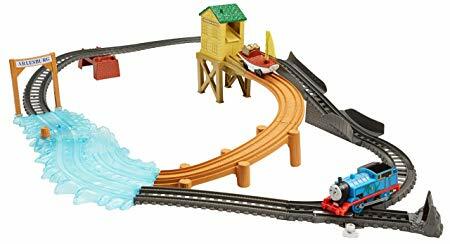 Playing with the features – seeing the waves splash around Thomas and pressing the stop-track to release him – can also help encourage exploration of how things work and discovery of cause and effect.